A galette is basically the hipster version of a tart. It is imperfect to perfection, rustic to the point of being refreshingly contemporary. And was the ultimate trend setter. Until everybody caught on. It also just so happens to be the easiest summer hack to entertaining. Don’t have a tart tin? Galette. Don’t have perfectly just-ripe fruit or veg? Galette. Don’t have hours to prep? Galette. Don’t want to hear more reasons? Galette. For real this time though. There is not much to say here other than if you obeyed the first rule of entertaining – always have a round or 2 of Flaky Pastry in your freezer (not actually sure if I stated that as ever being a rule. But it should be. It will save you days of panic) – then this (the I-didn't-have-time-to-plan-nor-buy-countless-ingredients-for-a-deliciously-complicated-main-throw-it-all-into-a-pie-crust plan B) rule number 2 , will be a breeze, . Here’s to the time-saving, waste-reducing, summer hack of 2015.
nibs etc. original recipe. Serves 6-8. Preheat your oven to 190*C Fan / 200 *C / 420 F.
Roughly dice your apple and rhubarb, and set aside in separate bowls. Roll out your defrosted (but still cool) round of Flaky Pastry. Sift your flour over the surface, leaving about a 1 inch border. Then scatter the apples, creating a base layer, and on top the rhubarb – this layering is more for aesthetic reasons than anything else – who doesn’t want to see juicy red rhubarb come out of the oven! Place your sugar in a bowl. Slice your vanilla pod down the middle, and with the point of your knife, scrape out the seeds, into your bowl of sugar. Mix with your fingers until vanilla seeds are evenly distributed throughout. Sprinkle evenly across the top of your galette.Then fold over the edges of your galette – taking 2 inch pieces at a time – carefully pressing each layer down onto the fruit, before lifting, folding and pressing the next 2 inch piece over it, rotating the galette as you make your way around, until all sides are up, folded, and pressed. 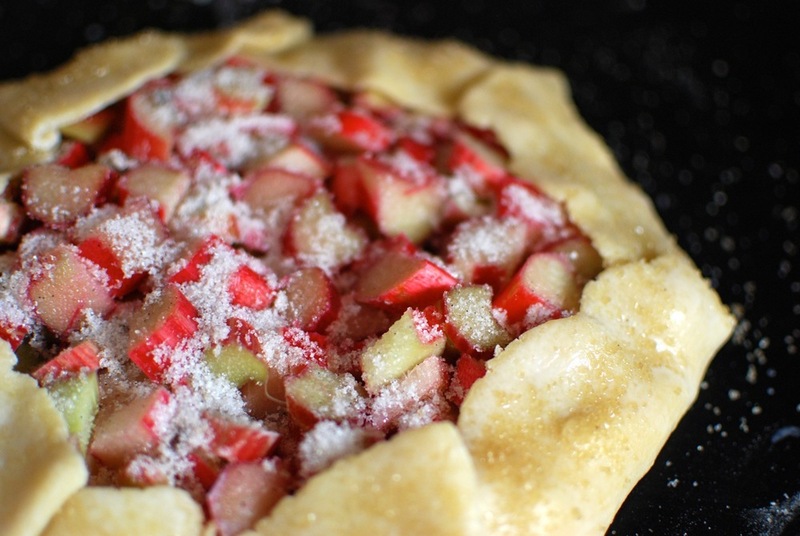 Brush down the sides of your galette with milk, and sprinkle with demarara sugar. 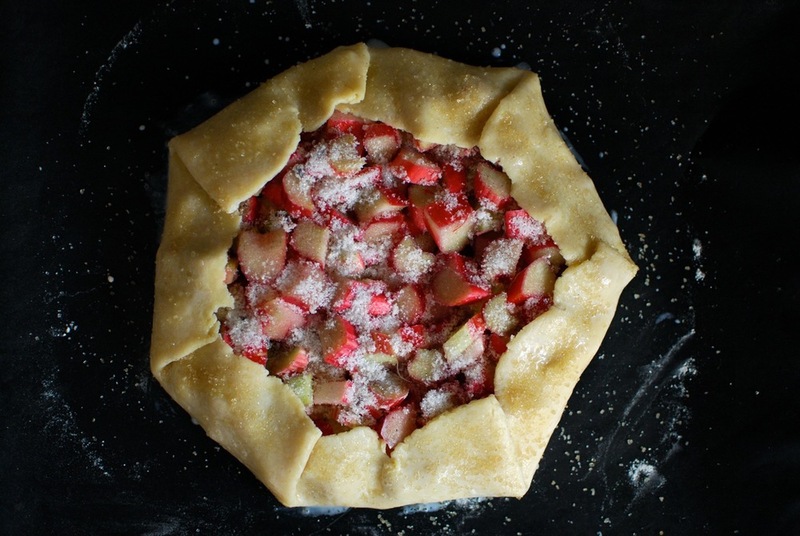 Place in the oven and bake for 20-25 minutes – edges of the galette should be golden brown, and the fruit should be soft, juicy, and slightly caramelized on top. With a heavy dollop of crême fraiche/whipping cream. For breakfast topped with greek yoghurt/skyr/quark. Made with any other seasonal fruit: peaches, plums, berries, just to name a few. Go savoury: caramelised onions+feta, courgette+aubergine, mushroom+goats cheese.